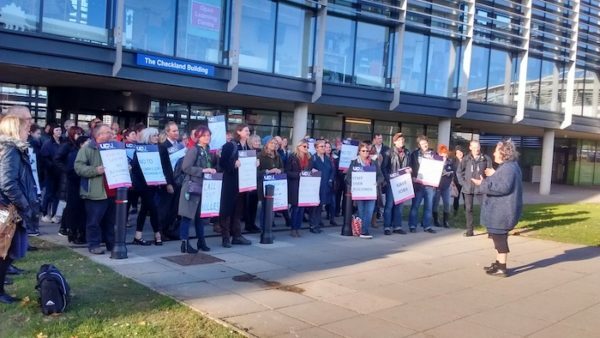 University of Brighton UCU was one of only seven institutions to successfully exceed the 50% threshold in last autumn’s industrial action ballot over pay. It was the third time within two years that Brighton had achieved a legally valid ballot result for action. First, it’s important to recognise that the 50% threshold is a hurdle put in our way to prevent us from taking strike action. That means that getting over the threshold is primary a pragmatic question, not one of principle. We try to get over it the best way we can. It also means that Get The Vote Out (GTVO) campaigns are technical operations that rely on an obsessive attention to detail. In none of the three ballots we have been involved in has an outcome in favour of action been in doubt. A heavy vote for action was always a certainty because by the time the ballot opens, the arguments around the issue in question and the necessity of action have already been won. Under these circumstances, a GTVO campaign is reduced to no more than that – simply getting people to vote. How they vote becomes almost irrelevant. We are as keen for members who are opposed to the action to vote as those who are in favour, because they all count towards the turnout figure. In our experience at Brighton there are two essential elements of a successful GTVO campaign: devolving and tallying. A GTVO campaign involves reaching every member and speaking to them as many times as it takes until they confirm they have posted their ballot. Because of the amount of work involved, the campaign will not be successful if it is waged only by the branch officers or the branch committee. Even a committee of 20 in a branch of 500 cannot do that, still less if the branch is bigger. Not only are the numbers against it, but so is the way many of our members work. We can’t rely on them to be sitting at their desks every day waiting to be spoken to. Some of our members are on proportional contracts and are only in for one day a week. Their vote counts the same as a full-timer’s. The solution is to devolve GTVO right down to a local level. Brighton UCU is fortunate in this respect. As a multi-branch institution we have a branch committee on each of our campuses. But this is still not enough. At Brighton we created action committees on each campus composed of members prepared to take on a handful of names to chase down. This gave us 60 or 70 activists working on GTVO – about one in ten of the membership. When there are that many people, they are not just taking names from a list. They are undertaking to speak to members that they already know because they see them regularly, or know where and when to find them. This makes a massive difference and means that GTVO can take place building by building, corridor by corridor, rest room by rest room. That leaves the branch officers to track down the difficult cases – members in far flung departments or isolated situations. The goal of the process is to cross people off once they’ve told us they’ve voted, so the other central aspect of the operation is keeping meticulous lists. The GTVO campaign needs branch officers and reps monitoring the progress of the action committee in each school, department, building or campus. After some trial and error, at Brighton we eventually discovered that the best form of list was an online document which many people could access, like a Google doc. We used a colour-coding system to register each member as they were found and spoken to and then once they had voted. Record-keeping is crucial because we do not have the luxury of wasting energy chasing people who’ve already voted. Nor do we want to antagonise members by continually hassling them after they’ve already confirmed they’ve voted. With a list system like this, you can track your progress towards 50% with a high degree of certainty. You can also generate a bit of healthy competition between schools or buildings. This is the key – generating a sense of responsibility for GTVO and the ballot result among the activists. A local ballot already produces this kind of responsibility. The branch leadership knows that they can’t rely on others to deliver the result. We need to foster this feeling in every school and department. That’s why, even in a nationally aggregated ballot, branches should behave as though it is a local ballot, and attempt to reach their own local 50% as early as possible. Anything beyond that can contribute to the collective effort. One final thing: if you’re not completely knackered by the time the ballot closes, you haven’t done it right! You’ll need the 14 day notice period before action starts just to recover.